Astronomers have discovered a cosmic one-two punch unlike any ever seen before. 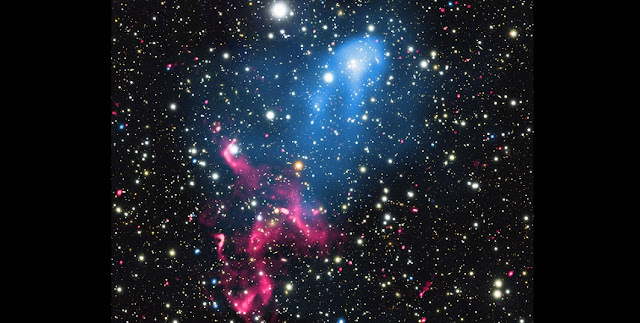 Two of the most powerful phenomena in the Universe, a supermassive black hole, and the collision of giant galaxy clusters, have combined to create a stupendous cosmic particle accelerator. By combining data from NASA's Chandra X-ray Observatory, the Giant Metrewave Radio Telescope (GMRT) in India, the NSF's Karl G. Jansky Very Large Array, and other telescopes, researchers have found out what happens when matter ejected by a giant black hole is swept up in the merger of two enormous galaxy clusters.